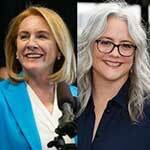 Candidates Cary Moon and Jenny Durkan will participate in a discussion moderated by David Hyde from KUOW Radio at 4:30 pm Sunday, October 22 at the Phinney Neighborhood Center. You are invited to join them to learn more about their plans and vision, ask questions, and make comments. Doors open at 4:30 pm. Free snacks, beer, and non-alcoholic drinks will be available. The forum, including audience questions, will be 5:00-6:00 pm with a half hour afterwards for socializing.